From the start of the final round of the AARR Championship at Slovakia circuit Cameron was determined for success, posting good times in the 3 free practice sessions on Friday. However, in the official practice later in the day the EE machine suffered technical problems. Roberto Baglioni and the team worked late into Friday night to ensure all was well with the machine for the qualifying session on Saturday morning, which saw Cameron qualify in 3 rd place. Race 1 saw Cameron 3 rd on the grid. From the start he was out in front, pushing hard and taking 1 st place with a margin of 13.848 seconds over the second placed rider. Race 2 on Sunday and Cameron was 2 nd on the grid and from the off he fought atough race with Martin Gbelec of the Czech Republic. Going into lap 6 the race was stopped due to an accident. Timings taken to the end of lap 5 which saw Cameron take 2nd place. 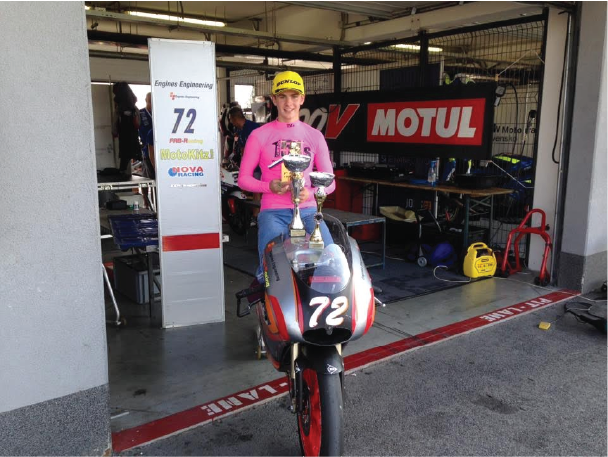 The combined results from both races were sufficient for Cameron to take the AARR GP125/Moto3 Open Championship. Commenting Cameron said, this has been a fantastic weekend, it was great to be back on the EE 125 and the victory in no small part is down to Roberto for his hard work on the bike, his guidance and what he has taught me. Also a big thank you to my team Fab Racing, my Dad and family for their support and help without which I would not have achieved this success. To have been given the opportunity to race in the Alpe Adria Road Racing Championship has been an amazing experience and thank you to everyone who had faith in me. The started off well for the teenager, and instantly showed his pace around the Donington Park circuit. In the wet free practice on Friday morning he posted a 1:59.641, leaving him in 16th and the sixth fastest standard class rider. The weather thankfully improved for the afternoon’s first qualifying session, and after small changes to his machine Cameron posted a 1:43.6, provisionally lining him up in 26th on the grid, and ninth in the standard class. On Saturday morning the Lewisham man improved in time by over a full second, posting a 1:42.669, leaping him up on the grid to 24th place, and seventh quickest in the standard class. From the lights in Saturday afternoon’s sprint race, Cameron made a great start and started to battle with the leaders of the standard class race. 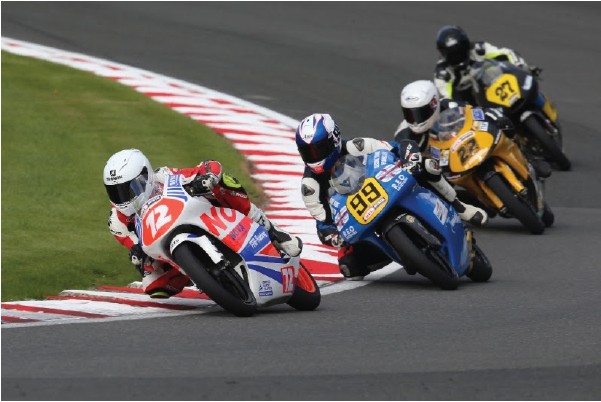 The Lewisham teenager fought hard all race long, posting his fastest lap of the weekend in the process, a 1:41.7, eventually crossing the line in 16th place, and seventh in the standard class, picking up ten Championship points. By virtue of his lap time from the first race, Horsman jumped to 18th place on the grid, and as the lights went out he made a great leap. He started to battle within a group of riders and was looking strong hunting down a podium spot, until he crashed out on the second lap of the race. After the weekend a frustrated Horsman said: “The weekend was strong for us, and I’m really disappointed with crashing out on Sunday. The team worked really hard all weekend and I felt a lot more comfortable on the bike. It’s nice to finally be back on track with what we are trying to achieve, and I can’t for the next round. 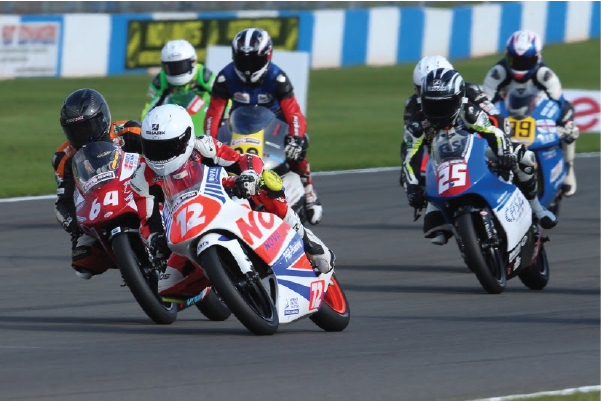 Horsman stays in seventh place of the Hel Performance British Motostar standard class on 174 points. The penultimate round of the 2016 season takes place in two weeks’ time as the series travels to Holland, and the TT Circuit Assen. The first free practice session on Friday morning saw Horsman work hard on track, improving the feel of his FAB-Racing/Nova Racing Honda NSF250R around the challenging Oulton Park track. In the afternoon’s second session the tall teenager improved in time, posting a 1:51.700 leaving him the seventh fastest standard class rider, only 1.6 second behind the fastest standard class rider Mark Clayton. Qualifying would see Horsman improve in time on the dry track in the second session, knocking off 1.8 seconds from his time set in the second free practice on Friday morning, meaning Horsman would line up in 27th on the grid for Sunday’s race. From the lights Horsman made a great leap from the line, and became embroiled in a battle for fifth place in the standard class with a group of five riders. The group were swapping and exchanging places all race long for fifth place, however mid race the group had dropped Cameron and he was forced to ride a lonely race crossing the line in 23rd, and ninth in the standard class. Cameron currently sits in seventh place of the Hel Performance British Motostar standard class standings on 164 points. The next round of the Championship is at Donington Park this weekend.